Lillian Engel ’19 and Azzurra Catucci ’18 received $15,000 to produce a 35-second film that illustrates the emotions of the moviegoing experience. Two weeks ago a team of Elon cinema and television arts majors trekked to Lynchburg, Virginia, to shoot footage for its entry in the 2017 Coca-Cola and Regal Films program, a contest for up-and-coming filmmakers that attracted submissions from the country’s top film schools. A crew of 13 Elon students and seven professionals helped produce footage for a 35-second film that captures the excitement of the moviegoing experience, bringing to life a script written by Lillian Engel ’19. The production schedule included a long shoot on Jan. 28 – both on location at a farm in North Carolina and McEwen’s Virtual Studio – followed by an overnight shoot the next day at Lynchburg’s Regal River Ridge Stadium 14 theater beginning at 9 p.m. To see photos from the shoots, visit the School of Communications’ Flickr page. Engel teamed up with fellow cinema and television arts major Azzurra Catucci ’18 to submit her concept for the Coca-Cola and Regal Films program last fall. Despite competing against more than a hundred submissions, the students were named one of five finalists and received $15,000 to produce their entry. Other finalists hail from the American Film Institute, Chapman University, New York University and UCLA. As part of the contest, Coca-Cola and Regal Films invited Elon to a two-day filmmaker kickoff event at Coca-Cola Headquarters in Atlanta. Pictured are (front, from right) Azzurra Catucci ’18, Rebekah Richin ’17, (back) Greg Grantham ’97 and Assistant Professor Youssef Osman. As luck would have it, Grantham serves as a creative director at CSE, the contest’s marketing agency. Osman said Grantham didn’t hide his delight at seeing his alma mater in the competition. ​The winning film entry, chosen by a panel of entertainment industry experts, will be announced at the CinemaCon conference in March. The film will then debut in Regal Cinemas nationwide later this spring. Additionally, the winning team will receive a RED Scarlet – W RED Dragon® camera package and its university will receive a RED RED EPIC-X 6K camera package. So what’s Engel’s concept? Boiled down, the script features movie poster characters that come to life seeking to quench their thirst with a soft drink. The main character is a cowboy, accompanied by a nearby astronaut and female pirate. Engel initially submitted her script idea for the 2016 Coca-Cola and Regal Films contest, in which Elon alumnus Eric Hernandez ’16 competed, finishing in the top three. According to Assistant Professor Youssef Osman, the presenting sponsors were enthralled by Engel’s idea, and when she submitted again for 2017 contest she was selected as a finalist. Osman said the judges had some initial trepidation over the concept’s technical challenges, but Engel won them over thanks to a filmed mockup she created with Andrew Steinitz ’17. With a little movie magic, poster characters can in fact become real. Matt Simmons ’19 and Engel prepare for filming on set at a North Carolina farm. Engel and Catucci succeeded in building a formidable team, aligning the project’s roles with each team member’s skill set. With Engel serving as editor and Catucci as production designer, the duo enlisted Steinitz as the project’s director and Rebekah Richin ’17 as producer. While these are the core four members of the project, Engel acknowledged the significant contributions of other Elon students and friends. This list includes alumnus Peyton Lea '10, a Charlotte-based cinematographer, who served as the project’s director of photography. Several professional actors and actresses, many traveling from Atlanta and as far as Tampa, also joined the mix. In preparation for filming and the weeks of post-production that will follow, Catucci, Richin and Osman attended a two-day filmmaker kickoff event at Coca-Cola Headquarters in Atlanta. During the early January event, the contest’s five teams gathered for workshops with Coca-Cola and Regal executives; CSE, the project’s marketing agency; legal experts and RED camera staff. Andrew Steinitz ’17 (red shirt), the project’s director, works with actors at the Regal River Ridge Stadium 14 theater in Lynchburg, Virginia. While developing a script, managing the creative process, and overseeing the casting and production have at moments been tedious – and certainly time consuming – Engel and Richin have enjoyed the project’s progress and look forward to its post-production cycle. “This past month has been one of the biggest learning experiences of my life, and I will be able to take the skills that I have learned during this project with me into all future endeavors,” said Richin. A person might wonder why the need to travel and shoot in Lynchburg? The students scouted several Regal theaters looking for the right location, specifically a facility with a marquee that fit their concept. There were two suitable locations within driving distance that fit the bill: Lynchburg and Charlotte. But the latter’s location is under renovation. Elon alumnus Peyton Lea '10 (right), a Charlotte-based cinematographer, preps for filming on Jan. 28 as Simmons (center) and Steinitz look on. Lea served as the project’s director of photography. ​Nevertheless, with filming now behind them, the students know that ultimately they won’t be judged on the appearance of a marquee, but how their script jumps from paper to the screen. “Our film is very production-design heavy, so the success of it largely depends on how realistic we are able to make our characters seem, and the worlds that they live in,” Richin said. As part of the 2017 Coca-Cola and Regal Films program, Lillian Engel ’19 and Azzurra Catucci ’18 received $15,000 to produce a 35-second film that illustrates the emotions of the movie-going experience. In late January, Engel, Catucci and a crew of 13 Elon students and seven professionals filmed footage for the film. Photos courtesy of Engel. First, notice how few listings there are at the end of January 2017. At the end of January we were down to a more reasonable 203 houses on the market, (still a bit higher than the 187 that sold during all of 2016) but down from the 225 exactly one year ago. The absorption rate is at 12-13 months, up from 10-11 months a year ago. We can attribute this to a slow start in sales to 2017, despite all the positive momentum realtors seem to be feeling and reporting. That's right, we only had 19 sales in the month of January, up from 16 in January 2016 so it is too early to say we are in a recovery. Also, it is worth noting that those 19 sales were sold at the median price of $1.4 million which represents a 28% drop from the median price a year ago. 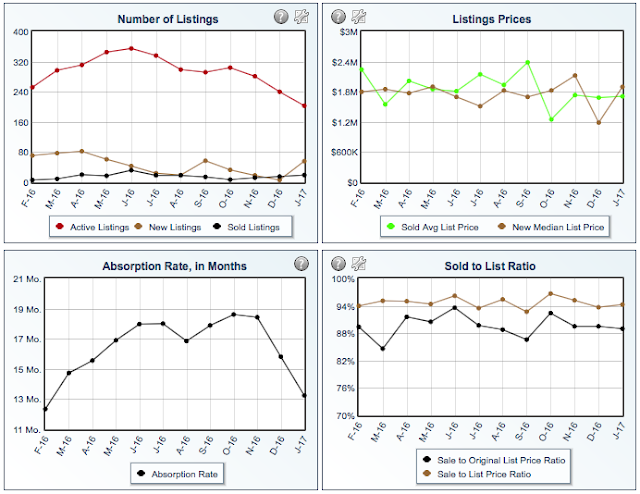 Days on market is dropping, however, and that is always a welcome trend. 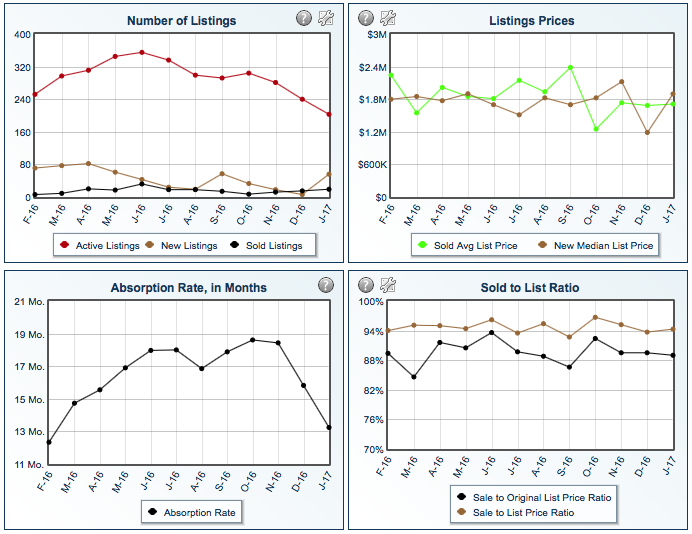 That tells us that the gap between buyer and seller expectation is narrowing. Either sellers are getting more realistic about pricing their houses or buyers are responding to the thinner inventory and coming up to meet them. Sold to list price ratio is holding steady at a fairly typical 94% which means the market is returning to a more balanced state.